Staples Center, Los Angeles, California, U.S. The 56th Annual Grammy Awards presentation was held on January 26, 2014, at Staples Center in Los Angeles. The show was broadcast on CBS at 8 p.m. ET/PT and was hosted for the third time by LL Cool J. The show was moved to January to avoid competing with the 2014 Winter Olympics in Sochi, as was the case in 2010. The eligibility period for the 56th Annual Grammy Awards was October 1, 2012, to September 30, 2013. The nominations were announced on December 6, 2013 during a live televised concert on CBS, The Grammy Nominations Concert Live – Countdown to Music's Biggest Night. Jay Z received the most nominations with nine. Justin Timberlake, Kendrick Lamar, Macklemore & Ryan Lewis and Pharrell Williams each received seven nominations. Daft Punk and Pharrell Williams were nominated twice for both Album of the Year and Record of the Year. Sound engineer Bob Ludwig received the most nominations by a non-performing artist, with five. Daft Punk won five awards, including Album of the Year for Random Access Memories and Record of the Year, with Pharrell Williams, for "Get Lucky". Macklemore & Ryan Lewis won four trophies, including Best New Artist, and led an industry show of support for gay marriage with a performance of their song "Same Love" to accompany a mass wedding of gay and heterosexual couples, which was presided over by Queen Latifah. Lorde's "Royals" received awards for Best Pop Solo Performance and Song of the Year. Carole King was honored as MusiCares Person of the Year on January 24, two days prior to the awards ceremony. On June 4, 2013, the Recording Academy approved a number of changes recommended by its Awards & Nominations Committee, including adding a new category for Best Americana Song to the American Music field. This songwriters' award will encompass all the subgenres in this field such as Americana, bluegrass, blues, folk, and regional roots music. The Best Hard Rock/Metal Performance category was renamed Best Metal Performance and became a stand-alone category. Hard rock performances will now be screened in the Best Rock Performance category. The Music Video field will become the Best Music Video/Film field. Its two categories will be renamed: Best Short Form Music Video will now be known as Best Music Video and Best Long Form Music Video will change into Best Music Film. These changes bring the total number of categories at the 2014 Grammy Awards to 82, up from 81 at the 2013 Grammy Awards. Chicago "Does Anybody Really Know What Time It Is?" Gary Clark, Jr. "Cop Car"
John Legend "All of Me"
Taylor Swift "All Too Well"
"Just Give Me a Reason"
Kacey Musgraves "Follow Your Arrow"
"Mammas Don't Let Your Babies Grow Up to Be Cowboys"
Trombone Shorty & Orleans Avenue "Same Love"
"When Will I Be Loved"
Lindsey Buckingham "Copy of A"
"My God Is the Sun"
Lang Lang - introduced "In Memoriam"
"Please Come Home"– Gary Clark, Jr.
"Whom Shall I Fear (God of Angel Armies)"
"Love Has Come For You"
"Build Me Up From Bones"
"Keep Your Dirty Lights On"
Apache & Crown Dance Songs — Joe Tohonnie Jr.
"Pensamientos For Solo Alto Saxophone And Chamber Orchestra"
"California Pictures For String Quartet"
"String Quartet No. 1: Funky Diversion In Three Parts"
"Side Hikes – A Ridge Away"
"The Moon's A Harsh Mistress"
The 56th Annual Grammy Awards were the first in the show's history to incorporate comprehensive Live-GIF integration through Tumblr. Creative agency Deckhouse Digital was hired to facilitate the integration, producing more than 50 animated GIFs during the live broadcast and publishing them to the official Grammy tumblr page in real time. The images contributed to the more than 5.1 million reblogs and likes that Grammy related posts received on the blogging site, and the record breaking 34 million combined social media interactions related to the live broadcast. ^ "Grammy TV ratings remain solid for CBS". USA Today. January 28, 2014. ^ "According to an Adobe Reader file from GRAMMYS.com" (PDF). Retrieved 2014-01-31. ^ ""The GRAMMY Nominations Concert Live!!" To Be Held In L.A. On Dec. 6". GRAMMY.com. 2013-09-18. Retrieved 2014-01-13. ^ "Jay Z Tops 56th Grammy Nominations With Nine". GRAMMY.com. November 6, 2013. ^ "Let's hear them Roar! Katy Perry and Lorde set to perform at the Grammy Awards as line-up is announced". Daily Mail. 8 January 2014. Retrieved 8 January 2014. ^ "The 2014 Grammy Awards Recap: Weddings, French Robots, Paul & Ringo". Billboard.com. 27 January 2014. Retrieved 28 January 2014. ^ "The 2014 Grammy Awards: Oldies, but not goodies". Washington Post. 27 January 2014. Retrieved 28 January 2014. ^ "Madonna the wedding singer performs as 33 gay and straight couples wed at the Grammys... and Katy Perry catches a bouquet". Daily Mail. 27 January 2014. Retrieved 27 January 2014. ^ "2014 Grammy awards – as it happened". The Guardian. 27 January 2014. Retrieved 27 January 2014. ^ "Grammys 2014: as it happened". DailyTelegraph. 27 January 2014. Retrieved 27 January 2014. ^ "Grammys Laud Giants and Upstarts". New York Times. 27 January 2014. Retrieved 28 January 2014. ^ a b "Carole King Named 2014 MusiCares Person of the Year". Grammy.com. Retrieved 2014-01-31. ^ "Press release, June 4, 2013". Grammy.org. Retrieved 2014-01-31. ^ a b "Madonna To Perform On 56th GRAMMYs". GRAMMY.com. January 24, 2014. ^ a b c Kaufman, Gil (January 14, 2014). "Some Massive Stars Just Got Added To The Grammy Lineup". MTV News. Retrieved January 21, 2014. ^ Miriam Coleman (2014-01-05). "Daft Punk to Perform With Stevie Wonder at the Grammys | Music News". Rolling Stone. Retrieved 2014-01-13. ^ Reuter, Annie (December 6, 2013). "Merle Haggard, Kris Kristofferson, Willie Nelson & Blake Shelton to Perform Together at 2014 GRAMMYs". 96.5 TIC FM. ^ "News | Grammy Awards Performance". Metallica.com. Archived from the original on January 7, 2014. Retrieved January 13, 2014. ^ Edna Gundersen (January 24, 2014). "Grammy show delivers diversity: Madonna to Metallica". USA Today. Retrieved January 24, 2014. ^ "Nine Inch Nails, Queens of the Stone Age, Dave Grohl, and Lindsey Buckingham to Close Out Grammys". Pitchfork Media. 2014-01-21. Retrieved 2014-01-21. ^ "The Official Site of Music's Biggest Night". GRAMMY.com. Archived from the original on December 3, 2010. Retrieved 2014-01-13. ^ a b "Special Merit Awards: Class Of 2014". GRAMMY.com. 2013-12-12. Retrieved 2014-01-13. ^ "In Loving Memory …". GRAMMY.com. 2014-01-25. Retrieved 2014-02-10. ^ "Grammy Awards 2013: In Memoriam". News.msn.com. Retrieved 2014-02-10. ^ "Deckhouse Digital Grammy Posts". Retrieved 2014-08-24. 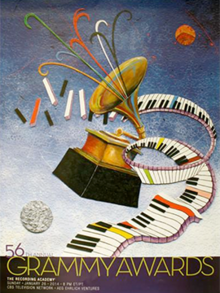 ^ "The 56th Annual Grammy Awards® Unites Music Fans With Record-Breaking Social Media". GRAMMY.com. 2014-01-30. Retrieved 2014-08-24.